Over the course of the previous 15 days I had run, walked and almost literally crawled close to 900 kms. I was totally exhausted, barely able to think my way through the simplest of tasks, no longer able to run, and I still had 130kms to go with just two days left to do it in. And before I could even start making inroads into the penultimate day’s trek we had to drive from Swanage all the way back to Exmouth. We made an early start but the roads were slow and made slower still by the weather. Yes, just for a change, it was raining! It took almost 2 ½ hours to reach the day’s start point – the ferry building in Exmouth – and waiting stoically for us when we finally arrived was my 87-year old Auntie Muriel, who just so happens to live a few hundred metres away. It was lovely to catch up with her, albeit briefly, and the bananas and fruit & nut chocolate that she had so thoughtfully bought were gratefully received (and very shortly afterwards, eaten). By the time we’d said our hellos and goodbyes it was 9.30am and ahead of me lay at least 13 hours on the trail. Time to get moving. I must have cut a pretty sad and pathetic figure as I trudged off down the deserted Esplanade, a lone presence in a grey, wet world. I climbed out of Exmouth to the sound of gun fire from another MOD firing range and around what must be the world’s biggest caravan park. I dropped into Budleigh Salterton and picked up Phil for the hilly section to Sidmouth, which we reached by late morning. We continued on, slow and steady, through our collapsed world that began and ended just metres in front and behind us as the low cloud enveloped all around us. It was eerie and strangely beautiful but I’d have swapped it for just a spot of sunlight at the drop of a hat. Passing beneath the spectacular Coxe’s Cliff, the top of which was shrouded in grey, was an other-worldly experience. Not too long after we rejoiced at the sight of a signpost that said ‘Beer 1 mile’. Alas, this didn’t mean free ale for anyone daft enough to be out in this awful weather; Beer is actually a place! When we got to this fantastically named village we were greeted by Sal & Beinn, but also by Tom’s parents Sheila & Richard who had continued following my progress and kept cropping up all along the trail to offer their encouragement and help. That’s the kind of wonderful people they are. Sheila & Richard walked with me from Beer to Seaton, which is just around the corner from Tom’s home in Axmouth. It was wonderful to see the whole Bland clan, out to cheer me on despite the weather, but my heart went out to Tom who still looked to be in a lot of pain and was hobbling around on crutches. Also there, bedraggled in his wet business suit, was another cousin of mine, Iain, who had come out of his way to wish me well. This show of support was almost overwhelming and I’m not sure at the time I was capable of expressing to everyone just how grateful I was for it. The day may have been drab and dreary but my dwindling reserves of willpower were topped up with each handshake, hug and friendly smile that I was getting. From Seaton to Lyme Regis there is a long, wooded section of trail that has earned near-legendary status amongst local trail runners. I’d now been joined once again by Chris who had offered to shepherd me through this tortuous, muddy, root-ridden piece of single track that reminded me so much of running back home in the Waitakere Ranges. I was having so much fun that without really meaning to I found myself breaking into a jog. Chris had thought we’d need at least three hours to get through this but we ended up doing it in just a little over two. What’s more, I was back to ‘running’ and it wasn’t causing excruciating pain. Some of the joy was returning. From Lyme Regis there are a few navigational challenges as the Path has been re-routed due to major slips. With visibility down to about 20m these challenges would probably have been too much for my sleep-deprived brain but with Chris’s local knowledge we made it through to Charmouth without any unnecessary detours. Chris’s job as the local guide was now done and he once more passed the baton to the Lean Mean Running Bean. With cloud hovering just above sea level, the temperature in very unseasonal single digits, and fading daylight, we struck off uphill to take on a series of sharp climbs and descents. I’d been feeling mentally exhausted for days but now for the first time I was starting to feel really physically weak as well. Climbs that would have been challenging on fresh legs started to take on epic proportions as I slowly wobbled my way up them. We passed over Golden Cap, at 191m the highest point on the South Coast of England, but with nothing to see except the inside of a cloud it could have been just about anywhere on the planet. With darkness falling fast we descended to Seatown where we pulled on an extra layer of clothing, donned our headlamps and continued on over another succession of rises. It was quite surreal being in a slowly moving world just 5 metres in diameter contained by wispy white walls. Our headlamps could not penetrate the boundaries of this world and the trail was faint at best. Had Garry not run over this route a dozen or so times in the past year we could be staggering around there still. I was profoundly grateful for his company and his local knowledge and shudder at the thought of what it would have been like trying to find my own way over those hills. At around 11pm, some 13½ hours after setting off from Exmouth, we finally hit West Bay where we’d found a pub to stay the night in. Sal offered Garry a lift back to his car but instead he elected to run alone back over the same hill we’d just descended. And I thought I was obsessed! I wanted my bed badly but more than that I wanted some hot, stomach-filling food. However there was nothing available other than yet another cheese and ham sandwich, the sight of which had me retching. But needs must and after forcing this down I set the alarm for 4.30am and fell asleep before my head hit the pillow. Just a few short hours later that same alarm awoke me to usher in the final day of the journey. Leaving at 5.30 a.m. 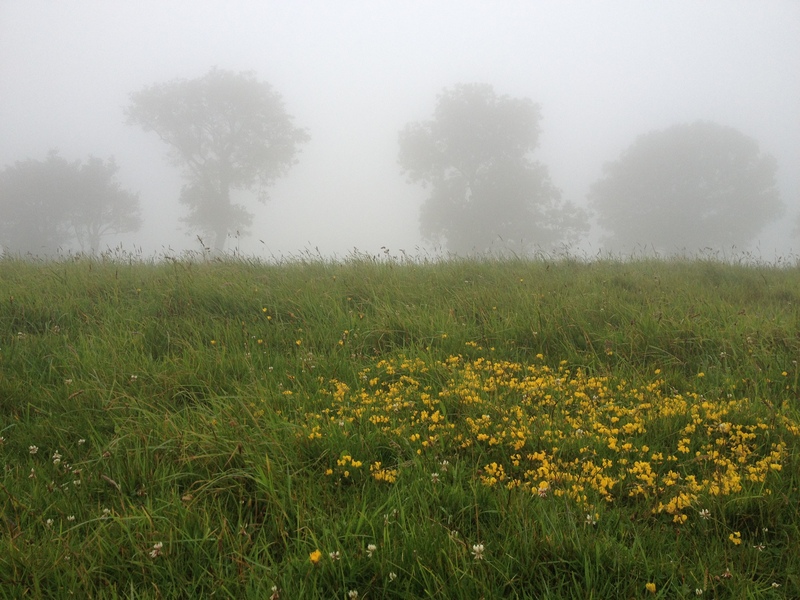 I ventured out into a moody, bleak morning full of puddles and brooding clouds. Straight away there was a series of short, sharp climbs but once these were done the way ahead flattened out considerably. My plan, based on the successful flirtation with gentle running that I’d had the day before, was to run 5 mins, walk 1 min, run 5 mins, walk 1 min and move at around 7 kms per hour. That way this last day need not last forever. But right from the word go I felt flat and listless. The simple fact was that I was totally and utterly exhausted by all that gone before. Grabbing just a few hours sleep and a totally insubstantial ‘dinner’ the night before probably didn’t help either. Try as I might I just couldn’t find the energy to run for more than a minute or two at a time. The rain was falling steadily and the trail was getting greasier and greasier. 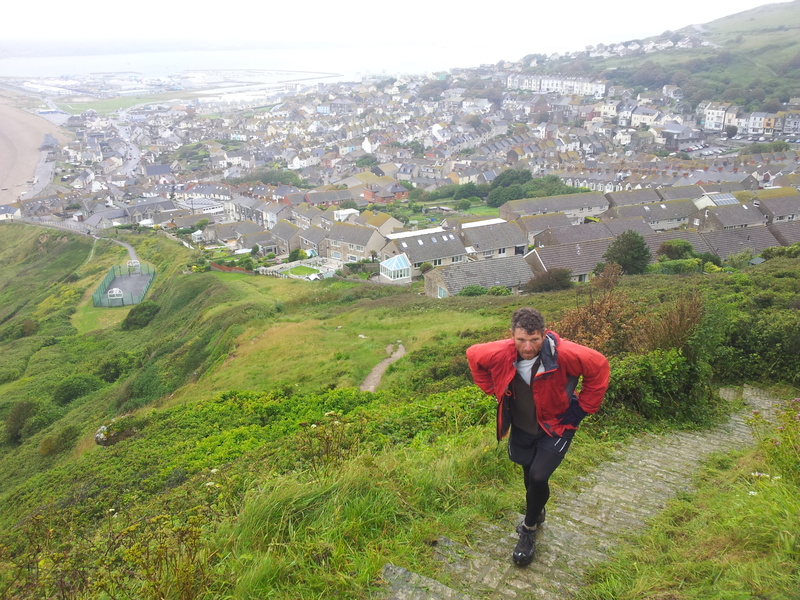 When it wasn’t muddy it was because it was traversing the soft shingle banks that marked the start of Chesil Beach. Mud or shingle it made no difference, the going was slow and I was getting increasingly desperate. And just to add to my misery my stomach started playing up. Half a dozen times over the next few hours I’d need to crouch in undignified fashion at the side of the trail and let it all out. My despair was complete. This last day that I’d hoped would be a celebration of all that had been achieved, was instead turning into a nightmare. At Abbotsbury, some 3 hours into the day, the Path started a big detour inland. 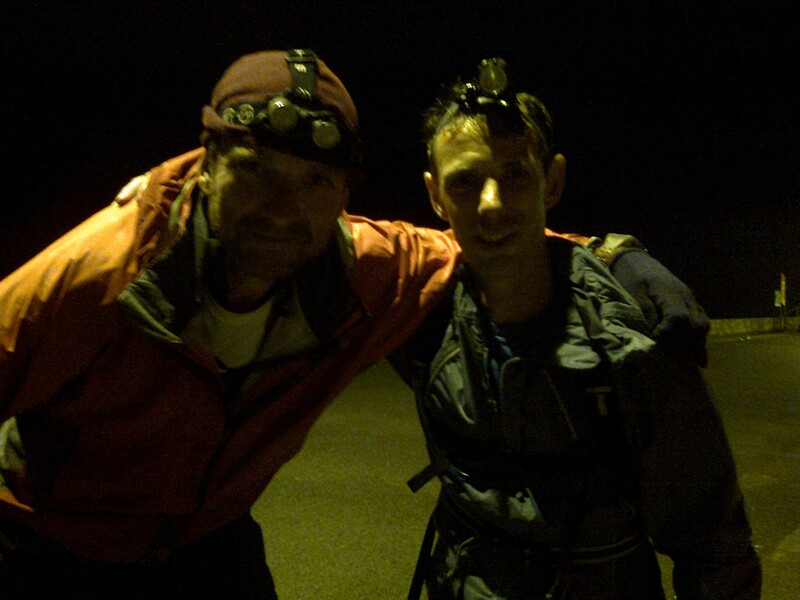 I met up with Phil for a support stop and then trudged off again into the rain. The next two hours were across wet, soggy, cheerless farmland littered with cowpats that lay like land mines in my path. In the distance I could see the lagoon at the back of Chesil Beach where I knew the Path would once again come into contact with the coast. Surely then things would improve? Wrong! The trail alongside the lagoon was the slippiest I’d encountered at any time since leaving Minehead. And still the rain came down, making it yet worse. This section was perhaps 10kms long but it took me over 2 hours – what seemed like forever. I was an hour overdue but eventually popped out at Ferrybridge and met the waiting support crew. I think I was more miserable at this point than at any other time during the whole adventure. Next on the agenda was the Portland Circuit – a 22km loop around the Portland Peninsula to get back to where we sat! It seemed pointless, futile and downright cruel. But it is the official route and it had to be done. I cried at the prospect before finally leaving the van and setting off with Phil. We didn’t last long – just 5 minutes later I realised that the 3 layers I was wearing weren’t going to be enough to keep me warm (hey, we were at sea level in summer so what would you expect?!) Phil called Sally on the mobile and got her to drive up the road so we could get a fourth layer on. I’d rather forget all about the next 4 hours but I guess for the sake of completeness I should risk permanent scarring and relive the experience. I concede that Portland has its charms but it also has the ugliest housing estates on the planet, a cement works, disused quarries, a very noisy working quarry and a maximum security prison. We got too close to all these and saw them all through a veil of very cold rain. I came to the conclusion that modern day Portland was founded by someone looking for a beautiful natural setting in which to build a shrine to all that is bad about England. And they succeeded in their mission. Right, that’s it. Any more will be too traumatic. It’s time to move on…. Back at Ferrybridge it was now late afternoon. We climbed into the Spaceships and set off to drive to Swanage. This was skipping the section of the Path that I’d done out of order a couple of days before. As we drove I realised that I’d just ticked over the 1,000km mark. I now had just 11kms left to do. The end was that close. But still the rain fell. It was the most dire weather we’d had and even though I could smell the finish my desire for more was non-existent. In Swanage we met up with Paulo, a running friend of mine from New Zealand who was over in England for his brother’s wedding. He’d driven several hours to offer his support and was now going to do the very last section with me. I’m not sure what he made of my mental state as I reluctantly left the warmth of the Spaceship and starting babbling inanely as we walked up the hill through the town. I was getting excited about finishing but I was also on the verge of delirium. I must have made very little sense. Never mind, Paulo smiled and nodded and offered lots of encouragement, which was all I needed in a companion right then. Soon enough we crested what I realised was the last hill. Ahead was flat along the cliff tops, then downhill to the beach, then flat along the sands to the finish. The finish! I could barely believe it! Like an over-excited school child on the last day of term I started finding new energy from nowhere and was once again running (well, kind of anyway). I ran most of the final 5kms or so and we found ourselves within sight of the finish way ahead of the time we’d told everyone we’d be there. I could make out a small huddle of people in the distance but wasn’t sure if this was Sal & co or not, so I sent Paulo on ahead to check them out. I did not want to reach the end and find I’d beaten the reception committee there! Done! Now give me a hug please. I don’t really recall what went through my mind over those last few hundred metres, other than the thought that it was all done and tomorrow I wouldn’t have to put on running shoes and head off for an insanely long day on a beautiful but brutal trail. I felt like I was flying over the last hundred metres (in truth, it probably took me close to a minute!) but soon enough I was in the arms of Sal and choking back the tears. Then Beinn joined in for a family hug and for a few short seconds I was, without a shadow of a doubt, the happiest man on the planet. It was done. 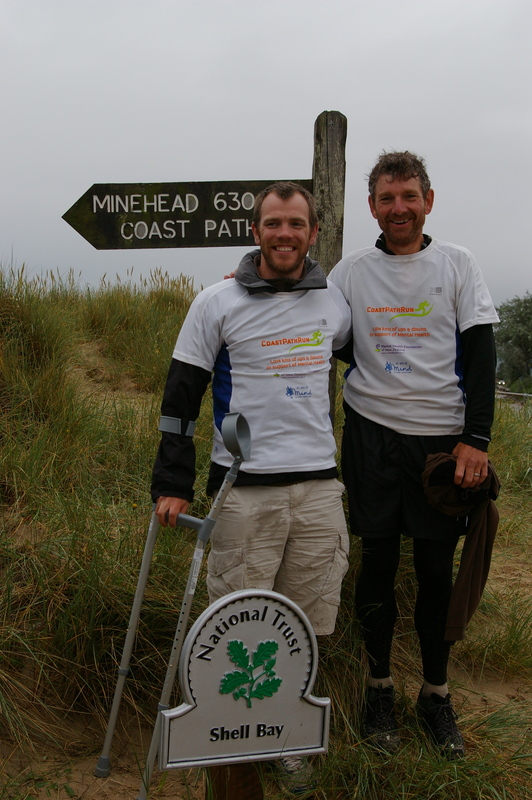 CoastPathRun – 1,014kms of ups & downs for Mental Health – had been everything I’d expected it to be and then some. It was without doubt the hardest thing I’ve ever undertaken. But because it was tough and because it was a physical and emotional rollercoaster it serves as the perfect metaphor for the battle against depression. Life and long-distance runs rarely go to plan, and often in our darkest moments the temptation to throw in the towel is hard to repel. But by adopting a “never, ever give up” philosophy we get through and emerge as stronger, better people for the experience. 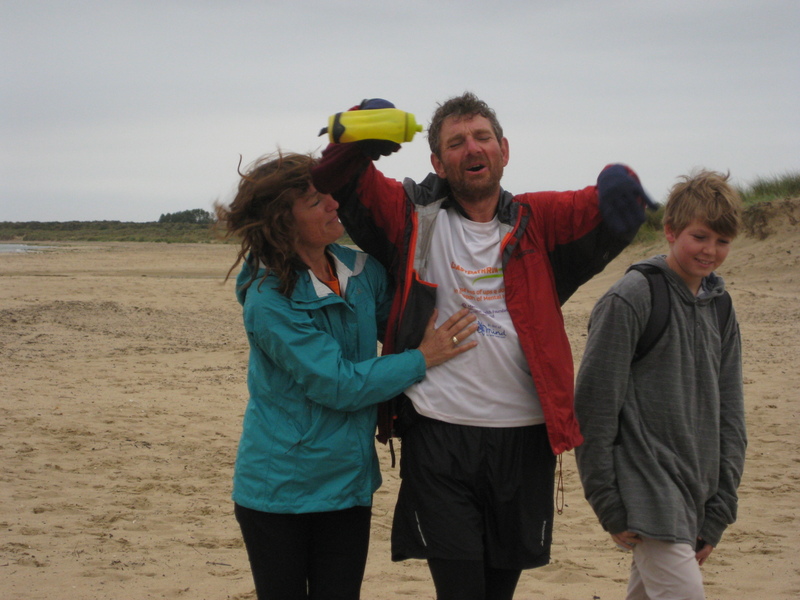 And speaking of strength, Tom was there at the finish, leaning sheepishly on his crutches. It was his dreaming, scheming and planning that had made this whole adventure possible. Every fibre of my being ached for him. It can’t have been easy to watch me finish without him, but with a great show of selflessness he was there to say “well done mate”. For that and for so much more I will always be grateful. 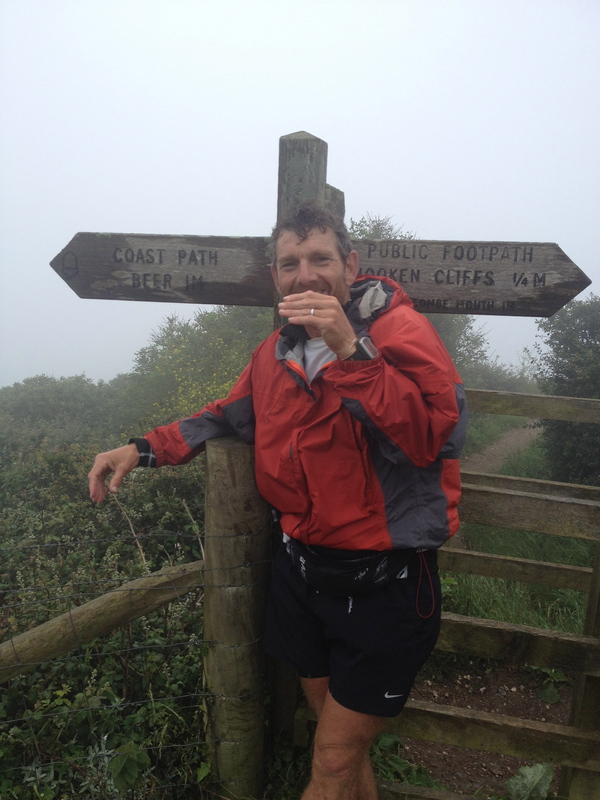 Tom’s dream of running the entire length of the South West Coast Path may not have worked out as he wished, but his absence from the Path is temporary. He too has adopted the “never, ever give up” philosophy and he WILL go back and finish it once he is recovered from his injuries. Please join me in wishing him the very best of luck. Good work Mal, I’m not easily impressed but I have to admit that was quite the insirational misson!